Coloured Raine Cosmetics is proving to be one of my favourites for everyday eyeshadow as well as lipsticks. Their Matte Lip Paints - review coming soon - are beautiful liquid lippies with 100 per cent pigmentation and staying power. I bought the Queen of Hearts Eyeshadow Palette after reading rave reviews. For those who have not heard of Coloured Raine, the brand was founded by Loraine, who wanted a range which encouraged self-expression and diversity. Currently, they have lipsticks, eyeshadows, nail polishes, and false eyelashes. Given the quality of the lippies and the eyeshadows, I hope they come out with more makeup soon. 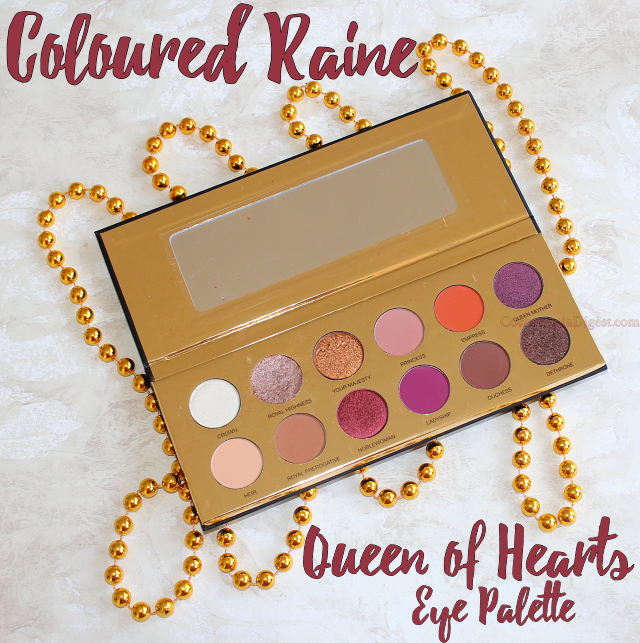 Scroll down for the review and swatches of the Coloured Raine Queen of Hearts Eyeshadow Palette. 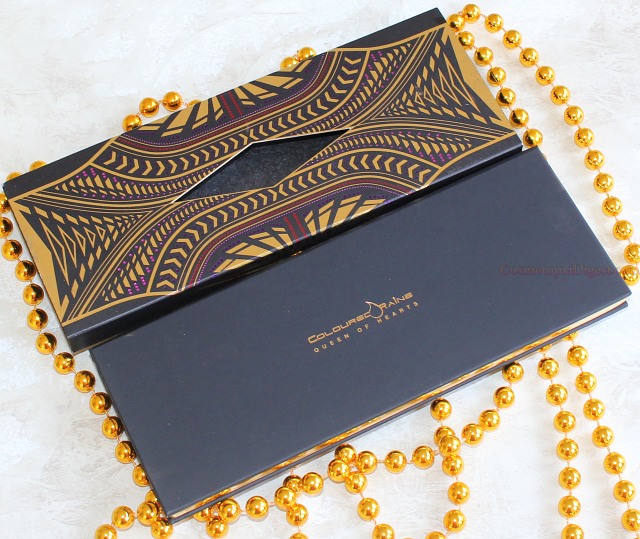 A word about the packaging of the Coloured Raine Queen of Hearts Eyeshadow Palette - the whole thing is cardboard, but the external slip case is gorgeous, with a black and gold tribal design, which I wish they had replicated on the palette itself. 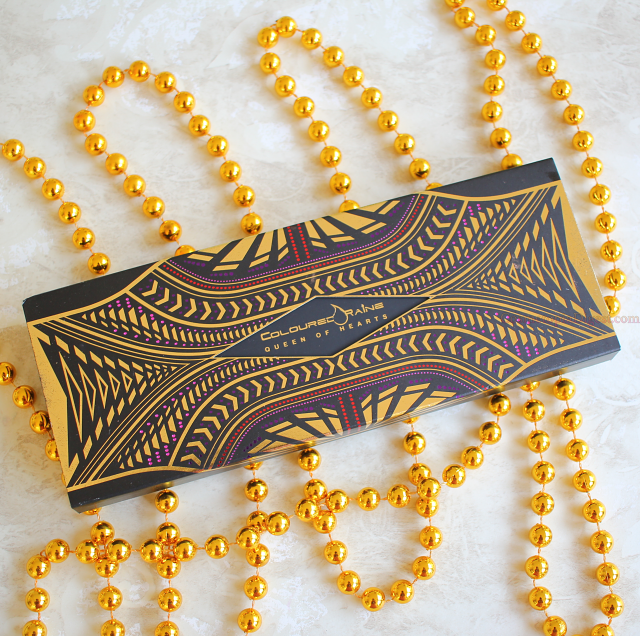 The palette is black and reminds me of the Lorac Pro palettes, though the inside is a glossy gold. There are just the 12 eyeshadows in this palette, and six of them are mattes, while six are foils. All the shades have royalty/peerage-based names. The shades are predominantly marsala/plum/purple/terracotta, which is the trend we saw in 2016. There are just the three neutral shades, and a white. The shadows are super-soft; soft enough to break at the least jostling. As you can see below, Royal Highness was broken on arrival and I had to put it back together with isopropyl alcohol. 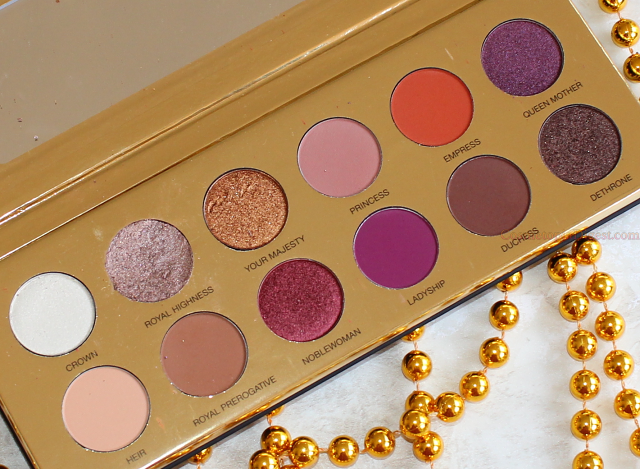 Princess is very similar to Buon Fresco in the Anastasia Beverly Hills Modern Renaissance Palette, reviewed here. The colour payoff is 100%, and staying power is great - I can actually get away without using a primer, though I'm not confident enough for this. 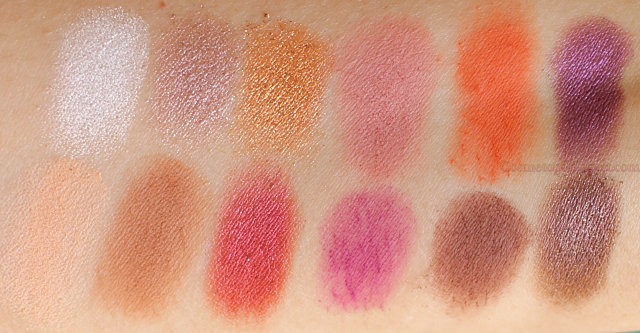 The mattes are all lovely and buttery and there's no chalkiness at all. The foil eyeshadows are so, so soft that you need to be careful while even swatching them or taking a brush to them - note the marks in Your Majesty. Those are actually from trying to remove the protective film! In direct sunlight, swatched with Wayne Goss Brush 18 (which I highly recommend), on bare skin. The same order as the palette. I had the mad idea of nicking my niece's stencil for these, only to find that there were other CRAYON MARKS on the edges, particularly on the bottom row. I had to do a tonne of clean-up afterwards. Lesson learnt. Here's an eye makeup look I did. For the full FOTD, including details of the shadows used, go here. I'm in love. The palette is a raving, tearing beauty, from the external slipcase to the shades included, all of which are right up my alley. 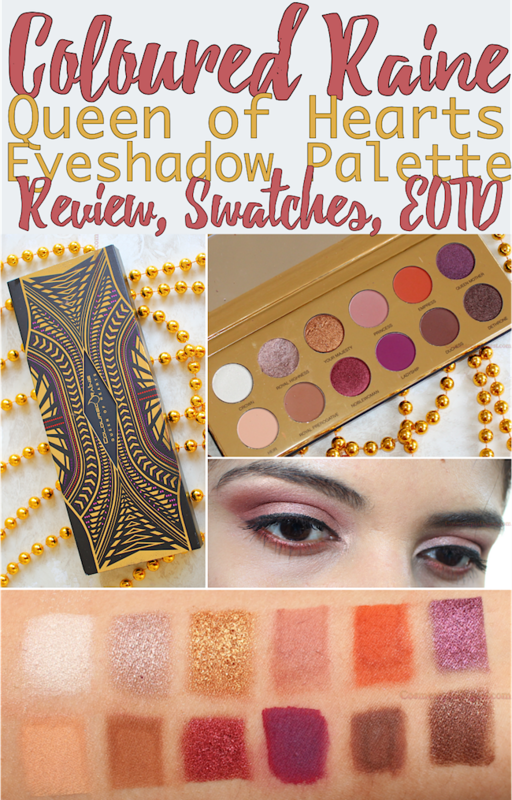 This is one brand to watch - I cannot wait for their next eye palette. I'll show you swatches of their fabulous matte lip paints over the next couple of weeks. This palette costs $50. A few of them are remaining at Beauty Bay, who ship worldwide (Free shipping beyond a point; varies from country to country). Rush to buy!